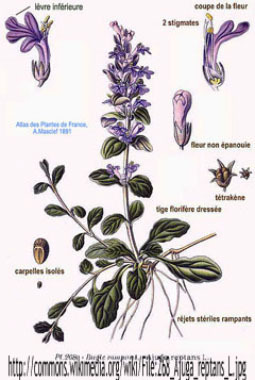 Bugleweed is in the Lamiaceae (mint) family and is native to north-western Africa (Algeria and Tunisia), Europe and western Asia (Iran, northern Turkey, Azerbaijan, Georgia and southern Russia). This is an evergreen perennial that grows at a slow rate. It has a long history of use to help with wounds, and is used in ointments and medicated oils. 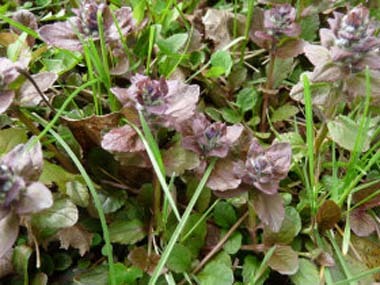 Distinguishing Features: Growing in a prostrate mat growth habit, bugleweed is perennial that is also used in gardens as groundcover. It has showy green or multi-colour foliage. It forms colonies of rosettes in damp meadows or woodlands. 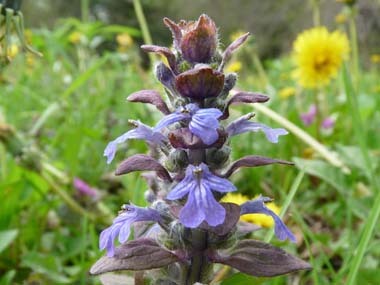 It produces short spikes of blue flowers and uses stolons (runners) to spread. Flowers: The flowers are hermaphrodite and are pollinated by bees (although they also attract butterflies and hummingbirds as well). Flowers are deep purplish blue and are in clusters in the axils of the leaves; the calyx has four broad, blunt teeth and the corolla is four-lobed, purplish in colour, with only two fertile stamens. Flowers May to September depending on location. 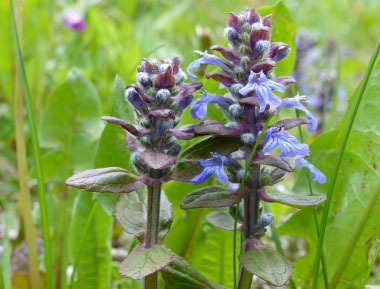 Fields of Nutrition has medicinal benefits and vitamin/mineral content of Bugleweed. 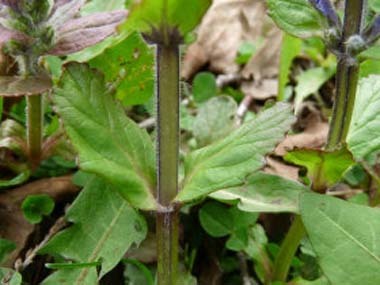 Leaves: The leaves are opposite; those on the upper part being toothed and lance-shaped, the lower ones wedge-shaped and with entire margins. The leaves are destitute of hairs and gland-dotted beneath. Lower leaves are generally 8cm long and 2cm wide. The dark leaves have an unusual colouration, with a purplish-brown or violet sheen on a dark green ground colour. Height: They grow anywhere from 5 to 50 cm tall. 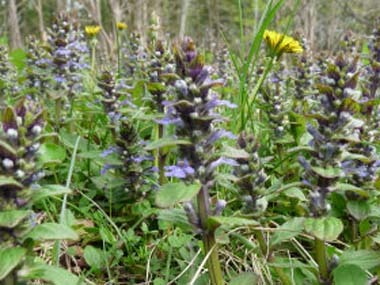 Habitat: Bugleweed tends to prefer areas that are slightly shady and damp although it is drought tolerant. It is typically found in damp grassy fields and around the edges of forests. It will grow in all types of soil (acidic, balanced and alkaline). Some people like to grow this as ground cover in their yards. It can be found in many areas across Canada, the U.S., Europe, parts of Asia, Africa, Australia, New Zealand, and South America. Edible parts: Young shoots can be eaten in salads or sautéed. Young leaves are also edible; use in salads, teas, casseroles, etc.